While bargain hunting at a drug store (imagine that! ), I spied a few egg dyeing kits. Prices started at $3. That is NOT a bargain. I’ve never bought one. Instead, I use food coloring, hot water, and vinegar for pennies, and still have supplies leftover for later use (most likely, using them independent from each other). Maybe you will want to bookmark this for next year. How to do it. Our family uses coffee mugs – one per color. In each mug, put 1 tsp. 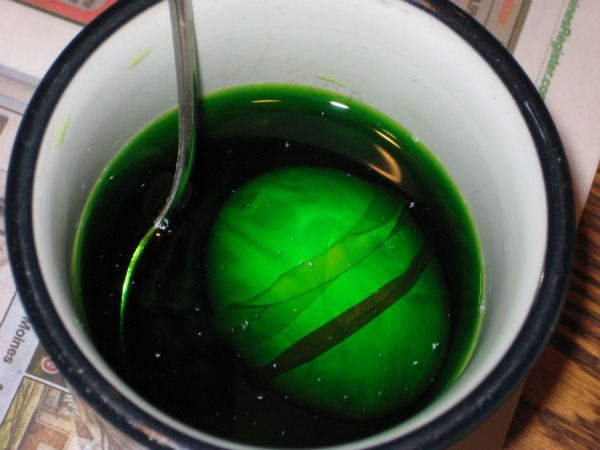 vinegar, 10 -20 drops of food coloring, and at least ½ cup of hot water. Tea kettles are handy for this. Stir the dye in the mug and that’s it! Add hard-boiled eggs and let them sit in the dye bath until the desired color saturation is attained. We have gotten many great custom colors this way. Rubber band resist – wrap a rubber band around an egg to preserve the color underneath it. Re-dye as desired. Use permanent markers to draw on the egg. Marbling – make a dye bath of hot water. Add coloring and 1 tsp. of oil, gently swirl with a fork or toothpick. 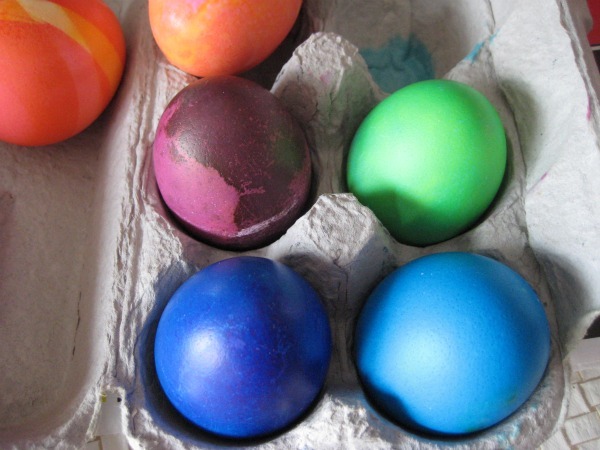 Dye (or re-dye a light-colored egg) by rolling the egg in the oil. Crazy Wonky Houses Quilt -- closer to done! This entry was posted in crafting and tagged egg dyeing. Bookmark the permalink.